Are you and your fellow trustees ready to up your game? Here is a great chance to understand where your charity is sitting governance-wise. Together with a structured conversation about how your charity can do things even better. You will learn lots in your Trustee Pit Stop, but it will also be interactive. 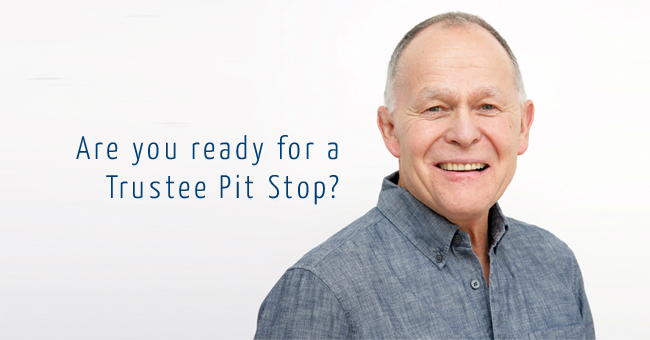 Your Trustee Pit Stop will be tailored to your charity. Each workshop will include applying your new knowledge to your charity. And happily it’s not in my nature to be dull! I will make sure your Trustee Pit Stop is an engaging, accessible, and value-added experience. We can schedule your two hour Trustee Pit Stop to suit your team. It can be during working hours, evenings or on Saturdays. The workshop can be held at your charity’s office. Skype may also be possible. I have a passion for helping charities to be their very best. And I’m well aware that your charity doesn’t have endless cash to splash. Each two hour Trustee Pit Stop is £135 for your full team. For, say, seven trustees, that’s about £19 per trustee. Compared to, for example, the Civil Society’s trustee training, at £195 for each trustee for five hours of training, these workshops are highly cost-effective. Travel expenses may apply outside London. • What’s going well with your trustee meetings? • How would you like them to be better? • What the heck is the charity SORP 2015 anyway? • What are the good points of your accounts? • Where are they letting your charity down? • How well do the skills and experience of your trustees fit your charity’s needs? • Does your board have unmet training needs? • How well are the different teams within your charity working together? Trustee Pit Stop D: Are the risks you’re taking intentional? • How clear are you as a board on the various risks you are facing? Are there any grey areas? • How comfortable are you with your risk profile – as a charity, a board, and as individual trustees? • Ownership and control – whose charity is it? • How aligned are your charity’s operations with its governing document? • How fit for purpose is your current governance framework? Trustee Pit Stop F: How well is your charity working? • How do you feel about your charity’s impact? • How well are your charity’s fundraising, budgets, finances and reserves, aligned with sustaining its mission? • How confident are you about your performance as a board? Just get in touch to book your first Trustee Pit Stop.